This elegant home has everything you need to make your vacation dreams come true. Destiny by the Sea is the most exclusive community in Destin. The home has over 4000 square feet of living space and another 1800 square feet of tiled deck. Upscale amenities include: golf cart, elevator, game room/bed room, DVD player with surround sound, X-Box 360, gourmet kitchen with granite countertops, 2 Weber Natural Gas Grills, fireplace and wetbar. Views of the gulf from 2 sides of the house. Beach access is very close (about 120 steps from front door- 1 minute walk). Community pool, hot tub and club house are a short walk from the front door. The name of the house is 'Bon Bini' which means welcome. You will feel welcome in this dream of a house. 4 King Master Bedrooms with baths and access to the deck, 5th bedroom is setup with 2 bunk beds with trundle beds (6 single beds). There is also a queen sofa sleeper in the bunk room. Four of the bedrooms have their own master bath and all five bedrooms have a balcony. Amenities: Gourmet kitchen with granite countertops and stainless steel appliances, DVD surround sound, TV's in all bedrooms, elevator, golf cart, wireless Internet access, community pool, hot tub, beach toys, baby equipment, gas grill, ceiling fans, dining room seats 14. Area: Very near Destin Commons, golf, restaurants and a few steps to the beach. Steve is a consultant to the Home Medical Equipment industry and owner of Hand & Stone Massage and Facial Spa in Marietta, GA. He lives in Canton, GA with wife Michele and son Jack. We purchased Bon Bini to enjoy special memories with family and friends. Our guests love the 1800 SF of outside decking that wraps around all 3 floors. There are views of the ocean from two sides of the house. The elevator makes it easy to bring luggage upstairs and the golf cart makes it fun to drive around the community. There are two Weber natural gas grills on the 2nd floor deck, conveniently close to the kitchen and living areas. Our guests have told us that the beach toys in the garage for the kids and the baby equipment is a big plus. We keep a well stocked kitchen to please the most demanding cooks. Parking for 2 cars. Plenty of beach toys, beach chairs and golf cart. Spices and some paper items. Dinning Room table sits 10 and there are 4 bar stools for the kids to eat at the kitchen bar. Lots of books in the living room cabinet. 2 large containers of beach toys are in the garage. 1800 SF of tiled deck that is on all three floors. Plenty of room for outside cooking and enjoying the sunsets. 1800 square feet of outside deck. We had a wonderful stay at bon Bini. Of all the VRBO I have done over the years this one had th ebest equipped kitchen. Great Grill setup and would be great for larger groups or 2-3 families with kids. Very close walk to beach and the gated community was ideal for a safe place for the family to walk at night. Location is ocnvenient to shopping and great restaurants ( like First Watch for breakfast and Pazzo Italiano for great italian food.) and is equidistant from the harbor at Destin and the Village at Baytown in Sandestin. Ample room and community Pool just a short walk (1 block) from the house. There is a golf cart to be used in the neighborhood but we did not find a need for this and did not use it. Beach chairs and plastic buckets for the beach in the garage. Elevator helps to get luggage to the top floor rooms and groceries up to the kitchen. All in all a very nice rental. Stay for a week. 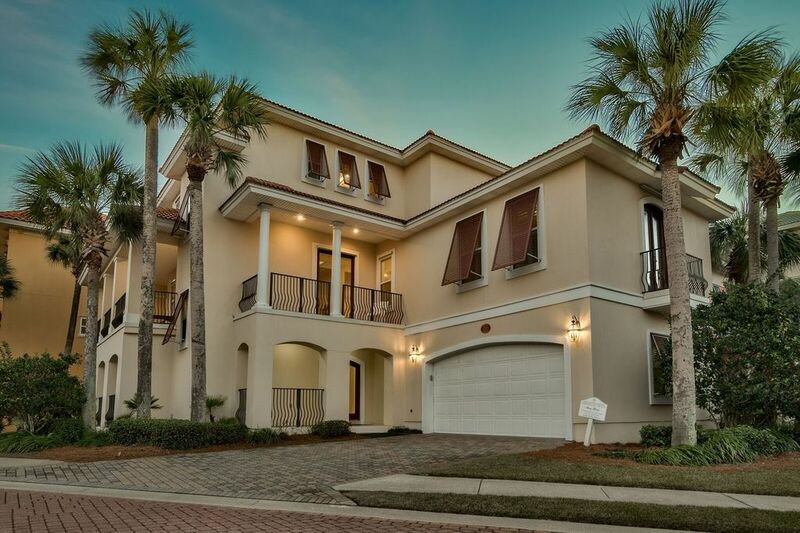 Bon Bini is in Destiny by the Sea, the most exclusive gated community in Destin. It is about 40 yards to the most beautiful emerald waters and powder white beaches in the USA. The house is decked out with every upscale convenience that you could possibly need. Just bring your bathing suit and prepare for the best vacation you have ever had.